thebakerwhocooks.net | Cocoa & Butterscotch says thanks! Cocoa & Butterscotch says thanks! Frequent readers of my blog will know that Dorothy (a.k.a. 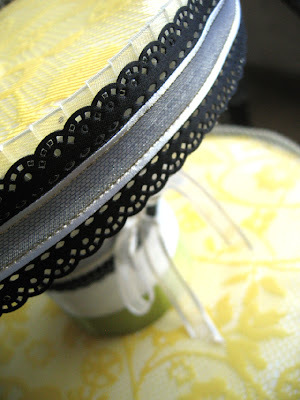 Dot) and I have been doing up cupcake tiers and baking cupcakes that match them. The cool thing is the customisation part and all our customers have been really happy with their tiers, thanks to Dorothy’s creative talent. It gives us great joy knowing that our tiers and cupcakes are making a difference and putting smiles on people’s faces. Us being a two-girlie team behind Cocoa & Butterscotch, we really strive to make this world a happy yummy place (yea that’s our tagline!) via our simple rustic ‘from-the-heart’ type of service & goods. 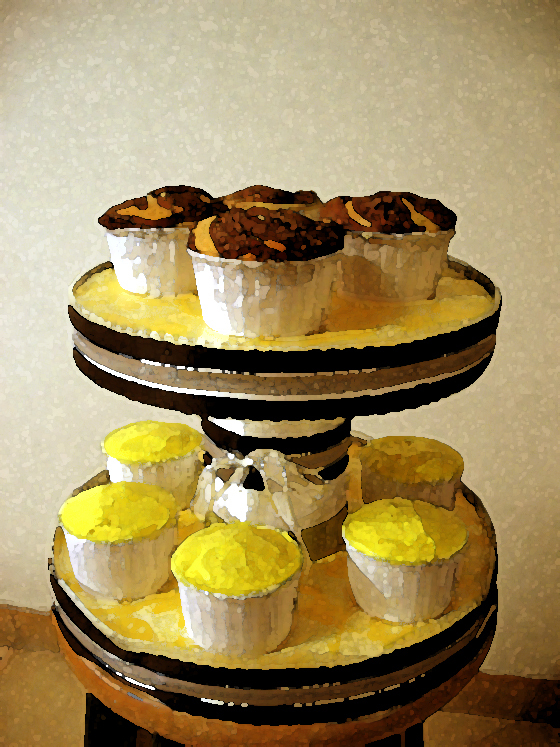 To be honest, it’s a real challenge juggling school & work (yea, Dot’s a full-time graphic designer) with baking and making tiers from scratch. But I do try my best to meet as many requests as possible. And allow me to take this opportunity to thank everyone out there who has given us your support, either by buying our stuff or just dropping comments or emails or even reading this! 🙂 I really do appreciate all the love… yes I do. I guess this blog has opened more doors for me than I thought possible and I hope to one day be able to really go all out and finally do my own thing, be it a real bakery/cafe/eatery of sorts. I am no gourmand, that I can safely admit, but what I do know is that I am passionate about food, and it’s lovely to see so many like-minded people around who believe in me and even bother to read this lil ‘ol blog of mine. So thank you all once again! So there, it’s something I have been wanting to post for a long time now! Especially since I know how much faith alot of you have in us. Dot and I are planning something a bit bigger for next year but nothing’s confirmed but I just wanted to give you a head’s up so that you know that we are always thinking of you, our dearest reader! 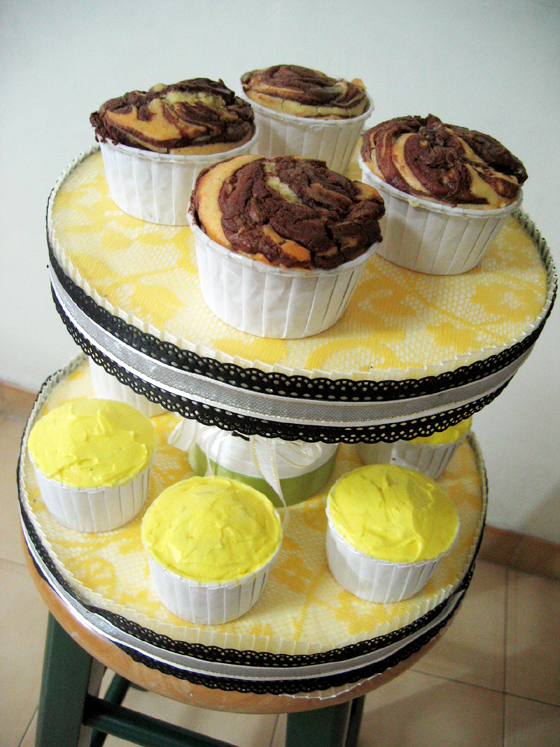 It was refreshing, doing a two-leveled cupcake tier instead of the usual 3-leveled ones. I guess it’s more befitting, since Thea wanted a simple one to celebrate with her family of four. 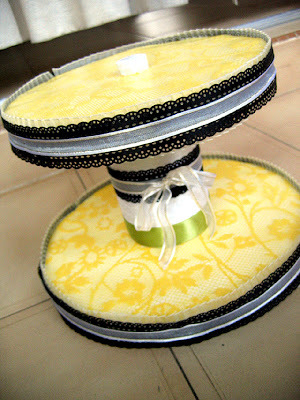 I heard from her that her mum really liked the tier and the lemon cupcakes! yay! So there you have it, one more tier in our list of merry-making endeavours. Looks delicious! Good job you guys! 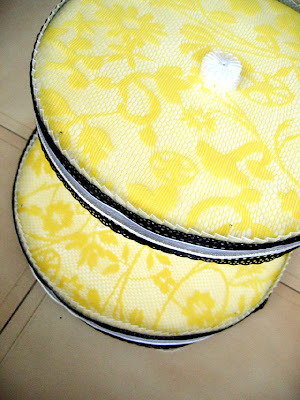 I too find the yellow floral patterns to remind me of summer.